Rate this Article Nowadays, searching for an ideal lifetime partner has become a daunting task for many. The Japanese however innovative as they are, are turning to the world of VR to find the perfect lifelong waifu lover. Despite the huge worldwide population and the reach of modern day communication, despite large shopping malls, parks and commercial centers, despite the internet, social media, chat servers and the like, so many people are lonely. Very lonely. One of the loneliest people in the world are the Japs. Despite the advancement in technology and automated lifestyle, Japans population continues to decrease. A large percent of the male population have found it increasingly difficult to hold a serious relationship albeit even have a working one with the woman of his dreams. This has resulted in less people getting married and having children. However, the problem of finding the right girl for a partnership for life has always been a problem that has plagued men since time immemorial, but in Japan today it is a very big social problem that affects the state of the nation itself. The country has gone through a massive economic upheaval (despite being one of the richest countries in the world). People lost jobs and finding a job has become increasingly difficult. Japan is rooted in culture and tradition despite its modernized society today. You cannot just have a relationship with a girl if you do not plan to go all the way into marriage with at least a child and all. You have no right to court a girl if you do not have a stable job. The women are very strict with regards to this and cannot accept a man unless he meets the requirements. Due to this societal tradition, many men in Japan have lost hope of ever getting a wife. Also, there are some women in Japan that do not want to leave their careers which they will have likely to abandon once they become a Mrs. As tradition dictates, she stays at home and takes care of the family. Of course there will always be exceptions to the rule but this is what is going on right now in general and the reason why we have to understand our Japanese brothers as well as those of us who go through periods of extreme loneliness. You would if you where in their place. Once this is understood we now move on to the word Otaku, the Japanese Nerd. While the nerds in the US are frolicking with the most gorgeous and scantily dressed babes (they had their revenge!) the Japanese have to content themselves with the most sexiest and beautiful Anime babes. If you didn’t know the reason why, you might have ended up laughing and rolling on the floor. You’re very tired and lonely and you need a girlfriend in a society where you see this cute girl almost everyday and you can’t even ask her out. Instead, you turn to the Anime princess with those longing eyes and beautiful curves that you somehow fall in love with and spend whatever money you have at Achibara just to have more and more of her. Many Otaku in Japan have this form of relationship which is considered as an accepted lifestyle. As time went on, many of today’s younger generation are following and embracing this way of life. Otaku is a general term while Moe (or falling in love with an anime) has a more specific distinction. The Gatebox is the latest technology to address the cry of Japan’s Otaku generation in their loneliness for the perfect sole mate. Prior to this, the concept of a Virtual Girlfriend for those afflicted by the condition became so popular with a dating game one can play on a popular handheld portable game console. The AI of the women however as so complex that an Otaku can actually have a romantic relationship with his Anime partner or Waifu (wife). She is always there for him and his emotional needs and except for the physical part (not just intimacy but being able to cook a great breakfast among other things) can provide a fulfilling relationship to these men. 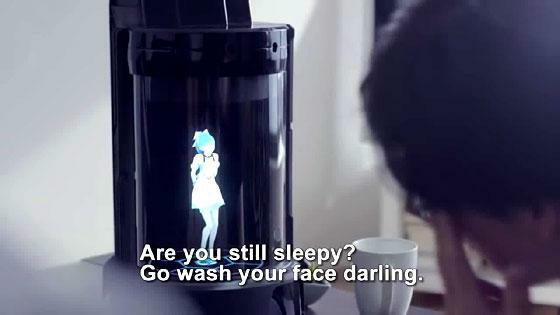 The Gatebox takes this a step further by providing an actual holo-projection of the owner’s anime Waifu. The prototype was recently announced and at present has only Azuma Hikari for a Wifu, but the company plans to add more selections or even custom make to the needs of the customer. Gatebox is actually an automated interface device that can take care of automated functions in a house like turning on and off the lights, automated appliances, security systems, home networks and other functions. Aside from functioning as an automated assistant, Azuma can be a friend, emotional supporter and Otaku waifu/lover. This holographic anime princess is trapped in a holographic tube device with a unit measurement of around 22 by 36 by 52cm and weighs 5 kilograms with the projector having a resolution of 1280 by 720. The unit comes with stereo speakers and a microphone so one can hold a normal conversation with Azuma. It also has other sensors like a camera, motion sensor, light and humidity sensors and touch buttons for control. The Gatebox VR is being developed by Vinclu (a company that makes crazy things and usually produces very unique items for a certain niche of consumers) and is planned to be commercially released by the end of this year. The price would be around 2,500 to 2,600 USD but shipping to the US may bring it up to as much as 3,000 USD. It’s expensive but considering what it can provide, Vinclu does drive a hard bargain. An English version is in the works as the prototypes can only support Azuma and Nihongo alone. The unit is a desktop device and can sit beside your PC, TV, bedside table or wherever you want to position Azuma for unobstructed conversation. What is scary about the Gatebox is the very real potential for an extremely lonely guy to fall in love with Azuma. She can even send and receive test messages to your phone while your out and urge you to come home early. Wake you up in the morning, remind you of this and that and show emotions like sadness and happiness just like a real girl with her foremost priority as your well being with the limitation that she is trapped in the Gatebox. 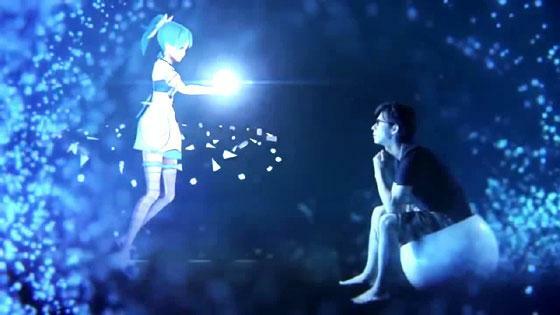 Azuma is from the 2D dimension of the “Anime” and interacts with our 3D world via the Gatebox. She is here to serve and love her master and do everything she can albeit limited to her holographic form and size, but the perfect lover to the lonely Otaku who will always be there by his side. It may be a scary but an amazing Mirae (future) for the lonely at heart but with the advances in technology and the obsessive research and development efforts the Japanese are doing to create lifelike female androids, you might just wake up one morning with “Cyborg She” for a wife.